You have chosen the music, decided on the flowers and menu, but there’s still something missing. That’s right – the tablecloths. Choosing tablecloths for your wedding ceremony is similar to preparing yourself for a party. If you are dressed in a specific dress – short, long, casual or formal, the next thing to do is choose the right bag and pair of shoes that will complement your dress the best possible way. So, naturally, when deciding on this accessory, it is important to consider the rest of the accessories in the decor scheme. So the question is: how to buy wedding tablecloths that will best complement your wedding theme and decor? Fine tablecloths feature a mix of beautiful materials, fine workmanship, expert construction and design. In your search, you will come across tablecloths made of cotton, linen, and polyester and will realize that each of them has their own benefits. Linen and cotton are absorbent, strong and easy-care table covers. On the other hand, if you buy wedding tablecloths made of polyester, you are buying durable, strong and long-lasting covers that can be either hand- or machine-washed. A white polyester tablecloth will provide a great backdrop against which you can create any theme and choose any colour you want. You will definitely come across a range of options, so here’s a bit help on how to buy the perfect wedding tablecloths. Before making a purchase, you need to know how many tables you will have as well their shape and size. Wedding tablecloths are available in many different sizes and shapes so knowing your table needs will help you narrow down the choices and find the perfect match. You can complete this by finalizing your guest list. First, decide what size of tables will be most suitable for your wedding venue and then, according to the number of your guests, decide on the number of tables. Do not forget the cake table and other food stations, if any. You need to know how you want to decorate your tables and chairs and then you can opt for the colour that will best suit your theme. Consider the season as well. It is a good idea to pair the certain colours of that specific season with your tablecloths. For example, if your wedding ceremony is in the spring, you can opt for an ivory tablecloth and pair it with at peach-colored table runner and baby blue covers for your chairs. 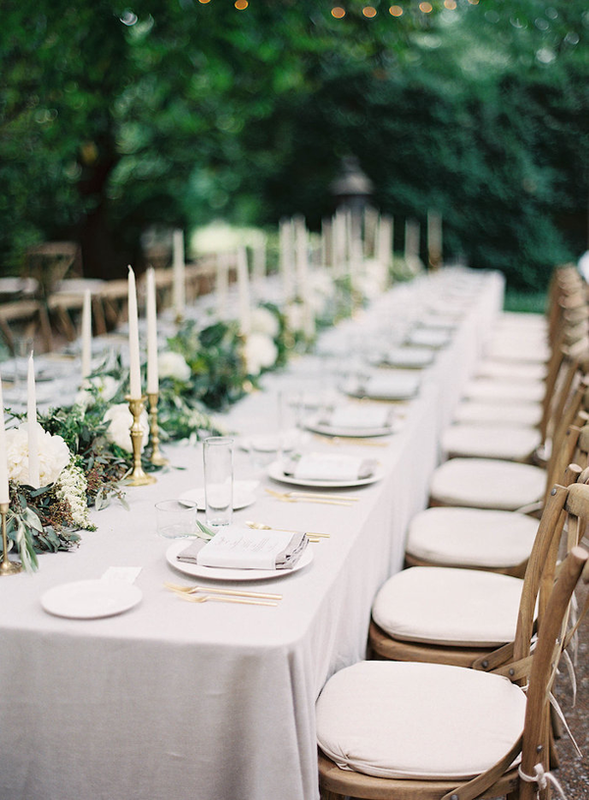 When choosing tablecloths for your wedding day, you need to keep in mind the rest of your wedding decor. For instance, if you are renting colourful dishes or bright centerpieces, a white tablecloth might be the best choice to go with. If you want a simple centerpiece then choose more interesting tablecloths to offset the decor.